Felton and District History Society welcomed Tim Maxwell as its first speaker of 2018. For several years Tim has been translating, from Medieval Latin into English, the Brinkburn Charters that relate to the Felton area. These formed the basis of his talk Felton-shire In The 1200s Part II, a continuation of his talk last March. ‘Felton-shire’ as a social and economic unit had existed in the Anglo-Saxon period and comprised the manor of Felton, as well as land at Acton, Bockenfield, Eshott, Thirston, Longframlington and Swarland. When the Normans arrived the area was awarded to the Bertrams, who in 1135 founded Brinkburn Priory. In 1154 they gave Felton Church to the priory so Felton-shire became of great interest to the prior. Its affairs were recorded in about 90 of the 270 priory charters. These portray the 1200s as generally a good time. The climate was good so animals and crops were raised successfully, and the inhabitants were well fed and getting richer. However, in 1209 King John and all his subjects were excommunicated by Pope Innocent III. Felton Church, along with all of the other churches in the country, was closed and the doors barred. No baptisms or burial services took place. After six years the pope relented and the churches were reopened. At the Fourth Lateran Council in Rome, in 1215, 70 new rules, or canons, were agreed. Some reforms had a local impact. The most obvious affected marriages. Marriage had always been deemed to have taken place after a public declaration by a couple and consummation, but now they had to take place within church after the priest had satisfied himself that both parties were consenting willingly and were not closely related. Religieux, who made up a significant percentage of the population as they came in many forms – parsons, vicars, chaplains, clerics, priors, monks and canons – were now required to adopt an extreme form of the tonsure, which left only a thin strip of hair around the head. They were no longer allowed to hunt, go fowling, take part in theatrical displays or participate in ‘trial by ordeal’. And they were forbidden to marry. The problem that religieux would have no sons to maintain the religious houses was resolved by requiring monasteries and cathedrals to establish schools to educate boys for a religious life. Although it seems that Brinkburn never established a school, Newminster Abbey in Morpeth did, and boys from Felton-shire could have been sent there. These schools worked well until Henry VIII dissolved the monasteries, causing the educational system to collapse. Churches now became sacred spaces, they had to be kept clean, and cloths and vestments washed frequently (previously the nave had been used as a meeting place and storage space). Everyone was required to confess once a year before Easter and the priest had to listen carefully and instruct about sin. The payment of tithes to the church now ranked ahead of every other tax, even those imposed by kings. Despite being 10 per cent of income, in Felton-shire there was little objection to paying. The inhabitants recognised that they benefitted from maintaining the church, which provided a form of welfare. Brinkburn had a hospital and fed the poor. Newminster had a type of alms-house, where the poor could live and be clothed and fed. The Magna Carta had little effect on Felton-shire, but the Charter of the Forest, agreed in 1217, had greater effect. The Northumberland royal forest had been huge, extending on the west of what is now the A1 from Felton to Belford. Gradually, the kings had sold off areas and the rights of freemen to use it had been significantly eroded. In 1204, the forest around Felton was sold to the Bertrams. The Charter re-established many of the old rights. The lord of the manor had to erect fencing to keep the forest animals away from crops. Firewood could be collected, wood taken for buildings, and pigs could be grazed in specified areas. However, the lord of the manor was still the only person who could hunt. In 1225 Bertram created a deer park at Felton. He surrounded it by a 6ft high palisade. The park caused a lot of problems as it covered the best cultivatable land. The prior of Brinkburn took Bertram to court, but the land remained fenced off and the inhabitants lost a valuable food source. From the late 1200s the good life began to deteriorate. The climate began to cool and for about seven years, from 1315, there was extremely bad weather, leading to crop failures and famine across Europe. About 10 per cent of the population of England died. Then another three per cent died when the Black Death hit in 1350. Between 1300 and 1400 the population of England halved from about six million to about three million. There were also problems locally. The last of the Bertrams died in 1272, deeply in debt. Thirston had already been sold and, after changing hands a number of times, was bought in 1309 by the Percys. The remainder of the estate ended up in the Court of Chancery for about 150 years when there were endless disputes over its ownership. During that period there was no lord of the manor and the cohesion of Felton-shire ended. The Scottish Wars began in 1290 and continued for 32 years. Both Scottish and English armies were large and needed enormous amounts of food. Parliament was called annually to impose taxes to pay for the war. There were huge Scottish raids into Northumberland and Brinkburn was raided annually in the 1290s. The fighting was vicious and massacres, perpetrated by both sides, were common. 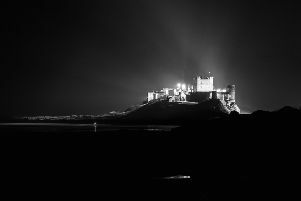 Northumberland became a War Lord zone, where castles were possessed and money extorted. The value of Felton, Thirston and Eshott fell by about 80 per cent. Burgage plots, which had been established in the late 1200s, were no longer in agriculture and commercial premises were destroyed, as was the deer park. Throughout the 1200s Felton had no vicar. The canons at Brinkburn took it in turns to take services in the church. From 1260 people complained, but it took the intervention of the Bishop of Durham, 60 years later, before the prior agreed. The first vicar took up the post in 1310. After a number of questions Tim was thanked for his fascinating and enlightening talk. The next meeting will be at 7.30pm on Monday, February 19, in Felton Village Hall, when Andy Stewart will speak on the British Air Service in the First World War, a talk entitled Frightening The Horses. Members and non-members welcome. Members’ annual fees are £15 and non-members are charged £3 a meeting.